Beside ads beckoning believers to explore Islam, attend services at the Boston Chinese Evangelical Church, or learn about the healing powers of Christian Science, the walls of the city’s subway cars will make room this month for another creed: nonbelief. 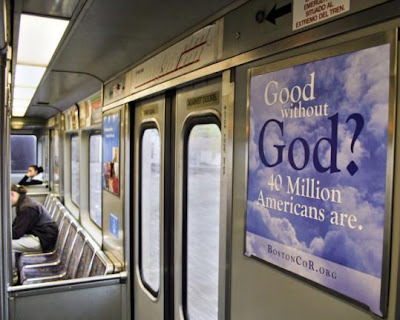 A group called the Boston Area Coalition of Reason has spent $11,000 to buy ads on more than 200 subway cars on the Red Line and Green Line to raise awareness about people who believe that God is a myth. Surveys suggest that they account for an increasing number of Americans. They also point to polls suggesting that the numbers of nonbelievers are increasing. A 2007 Pew Research Center for the People & the Press, for example, found that 20 percent of Americans surveyed between the ages of 18 and 25 say they have no religious affiliation or consider themselves atheists or agnostics, nearly double the percentage of those who said that in a similar survey 20 years ago. Another Pew survey that year found 12 percent of Americans surveyed who were 20 and older described themselves as not religious, up from 8 percent in 1987. The author of this article lumps being 'unaffiliated' or describing oneself as not religious together with being atheist or agnostic. This gives the impression that there is some kind of rising tide of 'nonbelievers' in America. However, being unaffiliated or identifying as non-religious in a survey tells us nothing about a person's belief or lack of belief in God. Rejection of organized religion, a well documented phenomenon in contemporary social science, is not the same thing as rejecting God. Research suggests that the "Nones" as they now being called, are a a complex and diverse group only a small portion of which could be considered atheists. Some have characterized these Americans as those who "believe but don't belong", which may be a more accurate description than "nonbelievers". Good without God? I'd settle for good journalism.